When Bill Arnold noticed two men with flashlights moving suspiciously around their dairy pasture just before midnight on July 24, 2002, Bill ventured out to confront the intruders. As he approached the shadowed figures, a familiar voice broke through the darkness. "Is that you Bill?" came the voice of Sean Isgan, an engineer and long-time acquaintance. "There's been an accident in the Quecreek Mine. Nine men are missing. We haven't got much time." Bill's reply came immediately, "How can I help?" Little did Bill Arnold realize as he entered the darkness that evening that the next five days of his life would center on helping save the lives of nine others. By daybreak, the 212 year old Dormel Farms would be transformed into the site of the largest rescue effort in Pennsylvania in nearly three decades. The land, buildings, home and equipment of the Arnolds' farm all offered support in the rescue effort. 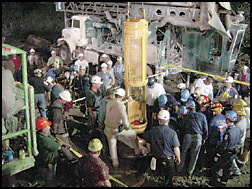 In fact, Bill Arnold himself turned the first soil in the rescue with his farm's old backhoe, to ensure that the first drill rig wouldn't rupture a dangerously close gas line. The ensuing five-day rescue effort and miraculous rescue of all nine miners is the stuff of dreams and legend. Few events since the safe landing of the Apollo 13 have caught the world's attention and emotion and ended with such a positive uplifting finale. But what has come to pass in the months since the rescue has surprised the Arnold family nearly as much as the event itself. Tens of thousands of people from all over the world have come to see the site where their prayers were answered, and they continue to come. Since the rescue, Bill, Bill's parents Dorcas & Melvin Arnold and family members of the rescued miners have greeted visitors to the farm, telling all who come of how God performed a miracle in Somerset, Pennsylvania. This tremendous show of public interest and support prompted the Arnold family to pursue the vision of developing the site into a - Monument for Life - a permanent monument to rescue workers, so often the unsung heroes behind the headlines. To help facilitate this process, the Arnold family has created the Quecreek Mine Rescue Foundation, a 501(c)(3) organization with a mission to "preserve the site & celebrate the inspirational story of the Quecreek mine rescue." 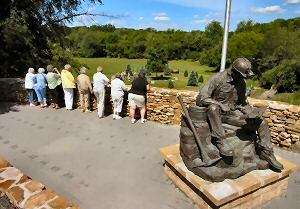 "The Quecreek Mine Rescue Memorial - Monument for Life - honors and portrays the team of rescue workers who saved the nine trapped coal miners from certain death. In a larger sense, the memorial site will honor the tireless heroism of rescue workers everywhere, as well as serve as a lasting tribute to the coal miners of Southwestern Pennsylvania and across the nation. In addition, the site will provide a variety of educational experiences for visitors. The plans and design for the Monument for Life are spirited and ambitious, much like the rescue itself. It is believed that when completed, the 5-acre site will be the largest tribute to America's rescue workers in the country. As you enter the monument park, you are greeted by a 7-foot cast bronze coal miner, as an honor to coal miners everywhere.The paved walkway leads you toward the center of the Monument for Life - an arbor garden tribute to all eighteen Quecreek miners that were in the mine that day. Here nine evergreens encircle a majestic Red Oak tree. To symbolize the undying determination of the nine miners, the evergreens will be bound together with a cable as the miners bound themselves together in the mine. The red oak symbolizes the faith and strength everyone showed in bringing "the nine" to safety. 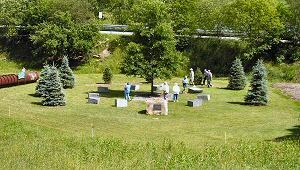 In addition to the trees, nine black granite monuments encircle another side of the Red Oak, to honor the first nine miners who narrowly escaped the mine flood, soon to become rescuers themselves. The rest of the site will largely remain pasture, as it was when the rescue took place. Benches, paths, picnic areas and complimentary plantings and landscaping will highlight the grounds. Site development began in March, 2003 and is ongoing. 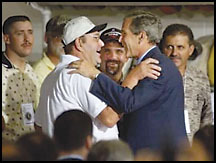 A public celebration was held at the site Saturday, July 28, 2007, the five-year anniversary of the rescue effort, and included former Governor Mark Schweiker as featured speaker. This improvement and preservation of this site, as well as construction of a building to properly display the artifacts and educate people about this rescue, will be supported largely through charitable contributions. Anyone interested in paying tribute to America's rescue workers or honoring America's coal miners can support the project by sending a contribution to the Quecreek Mine Rescue Foundation, 140 Haupt Road, Somerset, PA 15501 or calling 814-445-5090. You can found out more about contributing to the memorial building fund on our donations page.